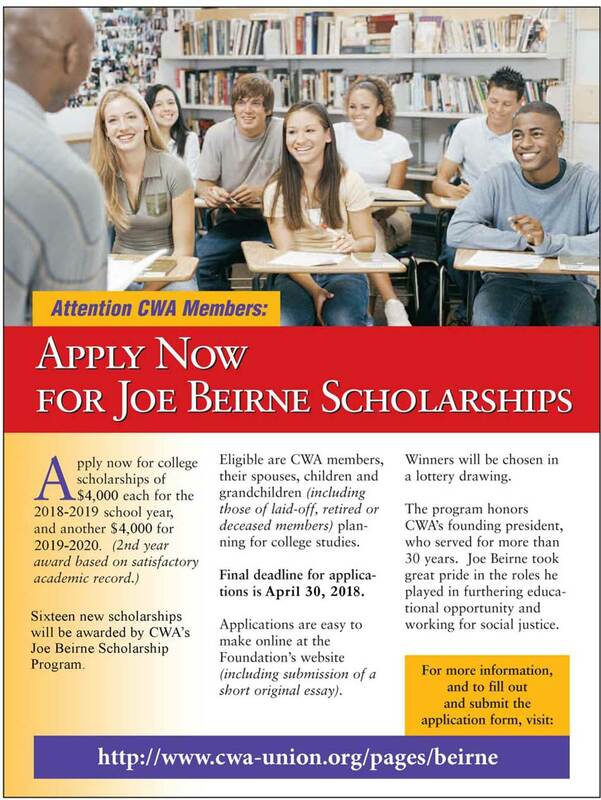 The latest CWA Newsletter is out! Once again, we are excited to announce that Unity@Mobility will be offering 15 scholarships for Mobility members to this year’s CWA Wireless Leadership Conference. 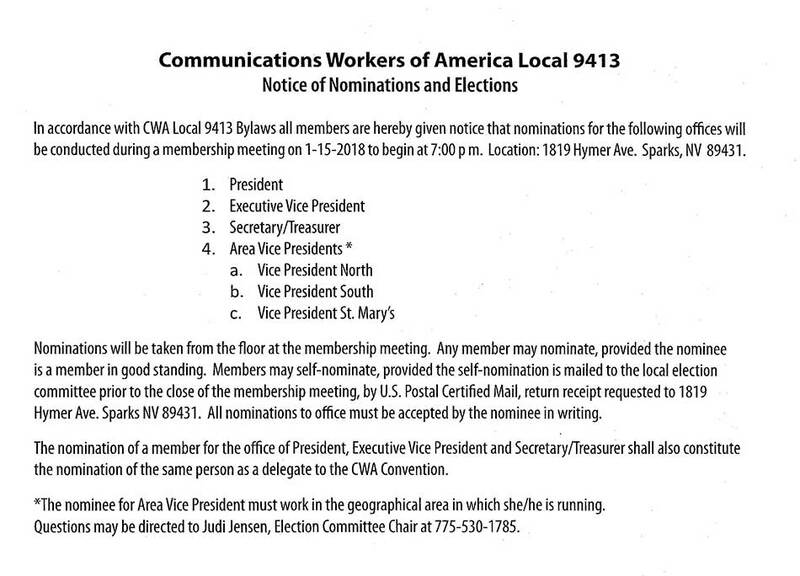 Nominations for Executive Officers and Area Vice Presidents for CWA Local 9413 were held January 15, 2018. Ballots will be mailed to each member's last address of record and should be received no later than January 31, 2018. Results will be tallied on Thursday, February 15, 2018 beginning at 10am and Officers sworn in at the general membership meeting to be held February 28, 2018 at 7pm. Please take a moment to support your mobility brothers and sisters that continue to fight for a fair contract. It only takes a minute and will have a huge impact if we all participate. On August 3rd, AT&T put out a statement on myCSP regarding commission caps. 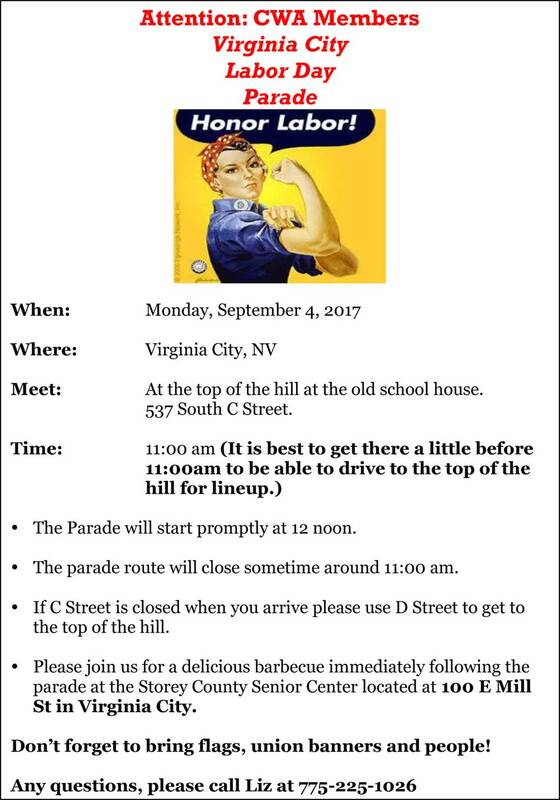 They announced that caps will be lifted for non-Orange workers. Some background information is useful. In July, the company unilaterally placed caps across the country on commissions, including in the "Orange" footprint. The company made these changes in Orange despite warnings by the union not to make unilateral changes to commissions. Since we were in the midst of bargaining with the company in the Orange footprint, this unilateral and negative change without bargaining was a violation of federal labor law. The union filed an Unfair Labor Practice charge with the National Labor Relations Board as a result. The Board is actively investigating this issue. Under labor law, it is illegal for a company to change any "term or condition" of employment unilaterally without bargaining with the union. While it was unfortunate we had to go to the Labor Board over their refusal to bargain on commissions, we are pleased to see that the company now seems to understand that they must bargain with the union over such changes. We will be bargaining on August 14th, which will give us plenty of time to negotiate with the company over these commission changes, so our members can benefit from the cap removal as well. We are still moving ahead with our planned conference calls with all the District VPs, staffs in the Districts, Local Presidents and a Town Hall call with all members to outline our plan to mobilize our members for the contract that will protect our members in the future. There will be NO General Membership meeting or Stewards Meeting held in the Month of August. 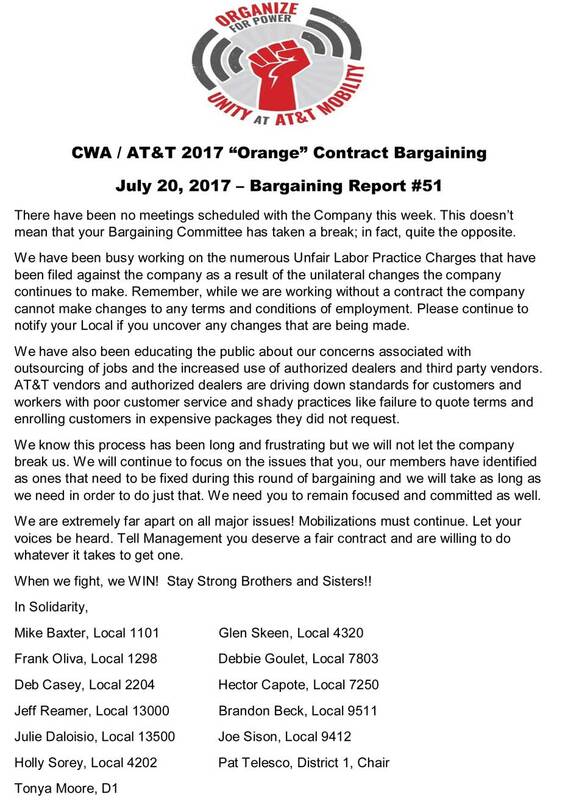 CWA has reached a Tentative Agreement (TA) with AT&T West. I have provided you below with a copy of the press release that went out today. I have also attached new proposed changes that were made. This is the information that was provided to the presidents and I'm now providing it to the membership. DirecTV unit will now receive retro pay from January 1, 2017 through September 2, 2017. Prior proposal was no retro and $250 lump sum. DirecTV Field Operations Techs and Installation Techs shall transition to the corresponding step of the August 2017 Premises Technician wage table in Attachment 2 that is equal to their equivalent wage step assigned above (i.e. step -to -step). Prior proposal was not a step to step transition. The only other proposed changes are dates only. The new ratification vote date will now be August 10th, so of course this changes dates in the original proposals. Please note that the explanation meeting will go more into detail. The explanation meeting will be on Monday, July 17th at 7:00 pm at the Labor temple located at 1819 Hymer Ave in Sparks. We will try to Live stream the meeting. 1. 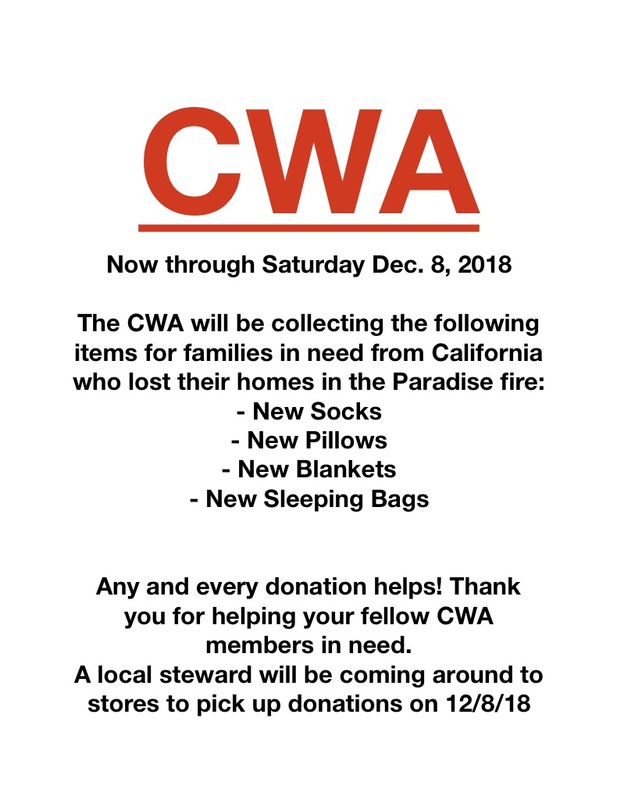 Confidentiality: Both the Company and the Union desire the mediation process to be completely confidential, with the exception that, if the parties reach a new tentative agreement it is understood it will be disclosed to CWA’s membership, internally within the Company and potentially to the public. There will be NO sharing of information during the mediation process. 2. Voluntary and Non-Binding: The mediation process will be voluntary and non-binding. 3. Ratification Process: Any new agreement reached in mediation will be subject to ratification by the CWA’s bargaining unit membership. 4. No Strike/No Lockout: The Company and Union agree that no strikes, work stoppages, or lock-outs of any kind will occur from July 7th until the mediation process is completed. Contact your Local to find out how you can help move negotiations in the right direction. It is important for everyone to be involved in mobilization as we all have something a stake in this process. All official negotiation and mobilization information will be delivered on the District 9 website (cwad9.org), Local Websites and email lists. An official release with more details will follow soon. There will be a discussion tomorrow with the local presidents as to how the union will proceed and I will have more information forthcoming. Copyright © 2016 - CWA9413.c0m - All Rights Reserved.